At Kirk Erectors, Inc., (KE) we believe safety is where business and family meet. This is why safety is our #1 core value and priority as we continue to work towards providing a safe workplace in achieving a 100% injury free goal. 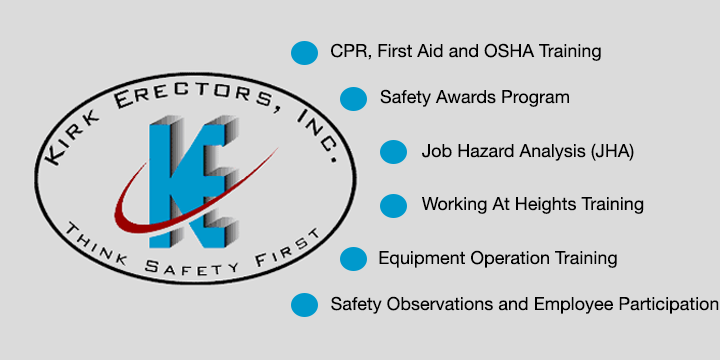 By focusing on our employees and their health and safety, we are able to achieve this goal because of our commitment in providing a highly skilled trade’s labor workforce in addition to our company’s field safety representatives performing continuous project site audits and personnel education training. Cooling tower construction is a unique industry in terms of safety challenges and advancements from the reconstruction process through and including new tower erection procedures. Safety should never be sacrificed for production though it must be considered an integral part of quality control, cost reduction and job efficiency. Our managers, supervisors and foremen are responsible for the implementation of safe work procedures and maintenance of a project site free from hazards to eliminate occupational injuries and illnesses, damage to equipment and property, as well as to protect the general public. Our Supervisors are OSHA 30-Hour Construction Trained and our Foremen are OSHA 10-Hour Construction Trained. We have designed and structured our Safety Management System (SMS) in accordance with OSHA’s Voluntary Protection Program Standards with emphasis on Commitment, Involvement and Continual Improvement. The success of our safety program is in its design. Our Safety Manual has been accepted throughout client organizations such as Avetta contractor screening and ISNetworld as a part of a comprehensive Safety Management System that is designed to ensure continuous improvement and foster an environment of cooperative compliance. Every element, sub-element and program in our SMS is audited quarterly with a comprehensive annual audit. During this audit and review process, we identify deficiencies in our system and develop remediation plans to eliminate the errors thereby continually improving our programs and procedures.